It’s that time of the year! Whether you just had the first sip of morning coffee or are at work, you can feel that festive fervor. Why don’t you let others know what’s on your mind! Wear your own feel! 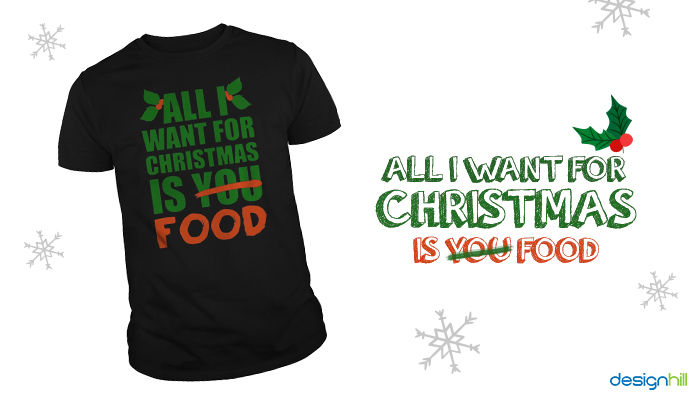 Choose your Christmas t-shirt design and show how you are feeling this Christmas. 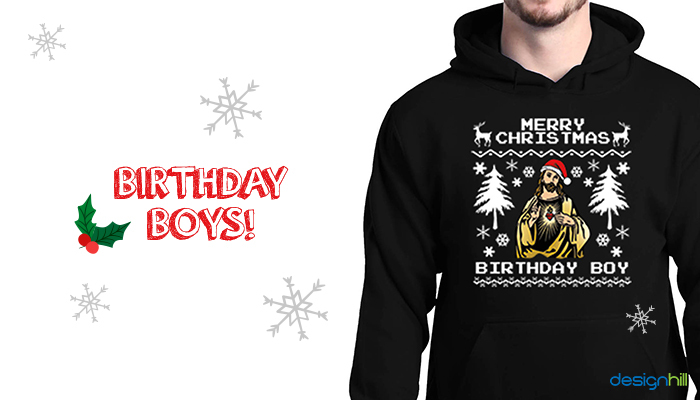 Check out a variety of Christmas t-shirt designs and make your personal choice. There are hundreds of Christmas t-shirts available in the market. However, a better idea would be to get a customized t-shirt design that will voice your personality and your mind. Want to go simple and direct? Just say, ‘Merry Christmas.’ However, the design that you pick should reveal how you are feeling. Get a custom t-shirt design and get it done exactly the way you want it. A picture is worth a thousand words, they say. You don’t have to say anything. 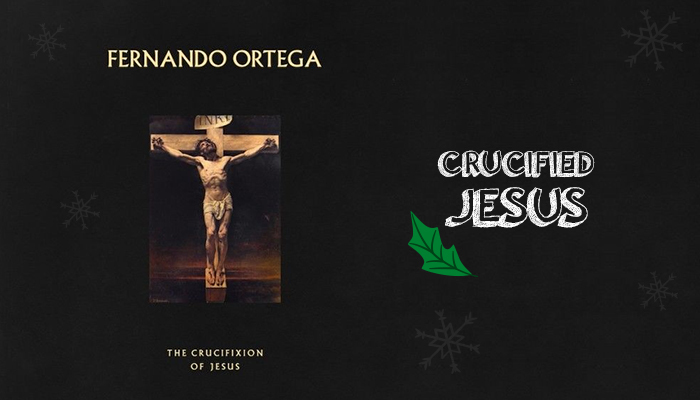 Choose any of the Christmas t-shirts with the image of crucified Jesus. This will tell everyone that you have the Christ in your heart and on your mind. If you want to go abstract, choose just the Cross. Get a custom clothing design for your t-shirt. You can pick one from our stock. Else, you can create your own t-shirt design using our design tool. You might find it a little too gross for the t-shirt to have Christ on the cross. Why don’t you choose a t-shirt that has just the face of Jesus on it? This is one of the most popular Christmas t-shirts. Design your own t-shirt and tank tops using Designhill’s t-shirt design tool. What’s the point of celebrating Christmas? You are happy that Christ was born, isn’t it? Well, just say it then. 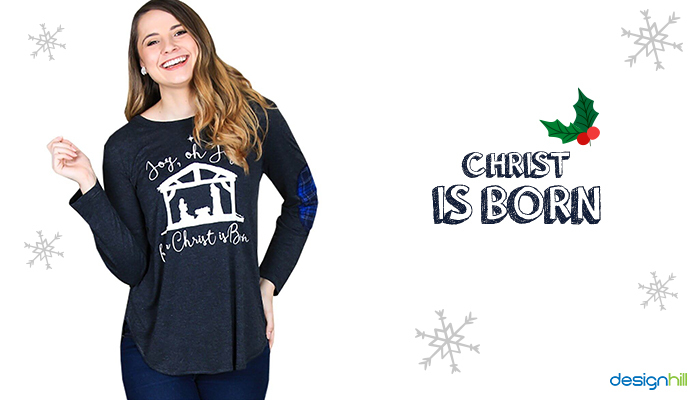 Go for one of the Christmas tee shirt or shirt ideas that have ‘Christ Is Born’ written on it. Find it in our stock or design it yourself using our tool. Ho Ho Ho!! Let your t-shirt scream in joy! 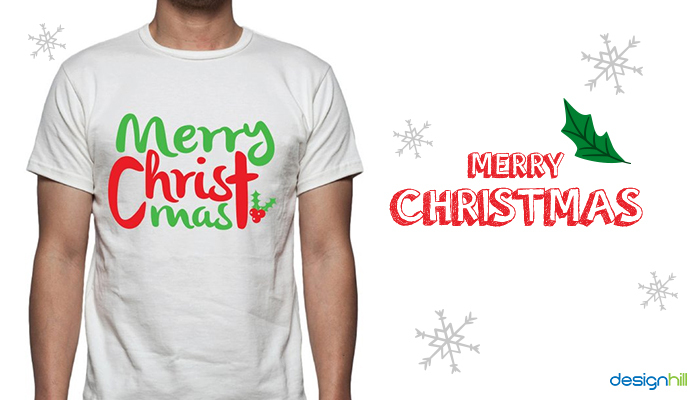 Use our t-shirt printing tool and get your Christmas t-shirt design. You can also choose from our stock. 07. Gin Gle All The Way! Yes! It’s celebration time, and you are in the mood to celebrate! Get t-shirt printing with lines that reveal how happy you are to drink through the Holidays. 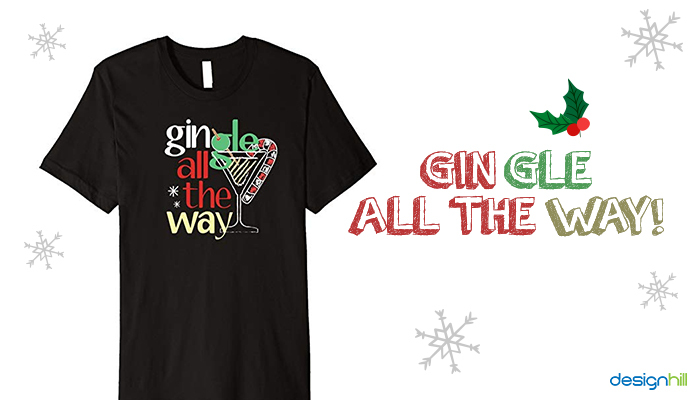 How about ‘Gin-gle all the way’? You surely didn’t miss the pun, right? Space can do wonders. Why don’t you create a logo for your business especially for Christmas? 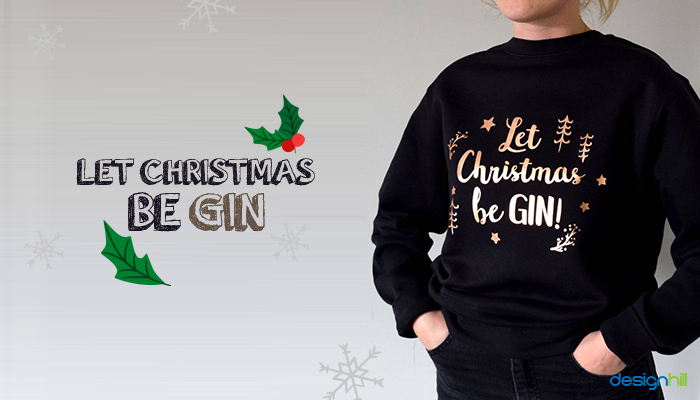 Print it on your t-shirt – Let Christmas Be Gin. See? Space brings in so much spirit! Looking for a different logo for Christmas? Want to get the logo printed on t-shirts, so that your team can flaunt it during the Holidays? 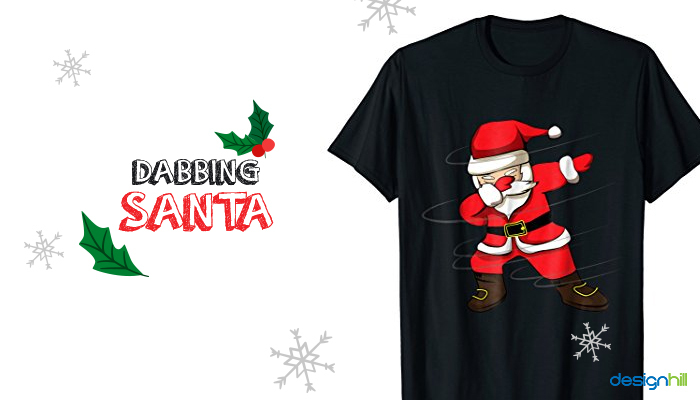 How about the ‘Dabbing Santa’? Use Designhill’s logo design tool and t-shirt design tool. You’ll get exactly what you are looking for. 10. Dear Santa, I Can Explain! Have you been naughty recently? Do you feel slightly guilty? Don’t worry. You can always explain. Explain it to Santa. 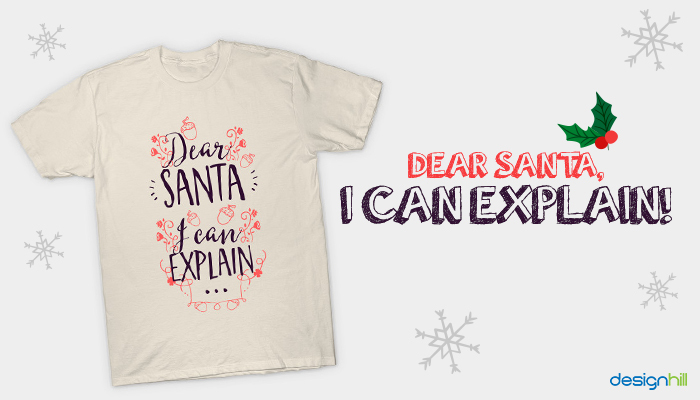 Tell him, “Dear Santa, I can Explain.” Hire a professional graphic designer on Designhill and get your t-shirt designed. Are you obsessed about Christmas celebration? In that case, you are suffering from OCD – Obsessive Christmas Disorder. Let your t-shirt speak the word. Choose our graphic design services and get ‘OCD! 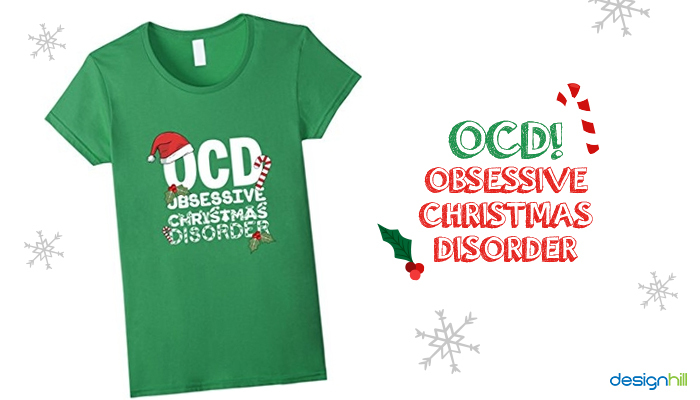 Obsessive Christmas Disorder’ designed and printed on your t-shirt. A weed lover? Smoking up is all you want to do during the Holidays? 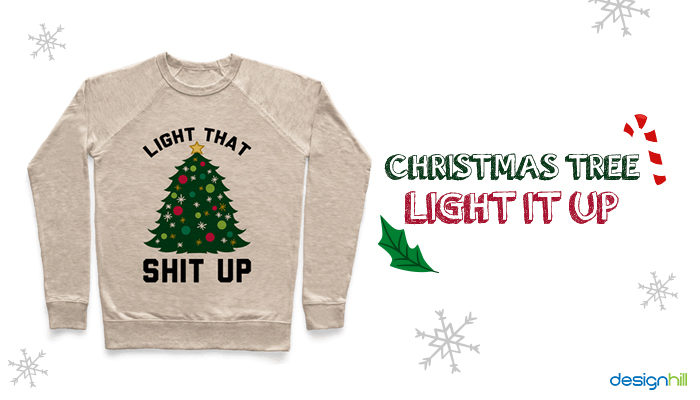 We have the perfect Christmas t-shirt for you. 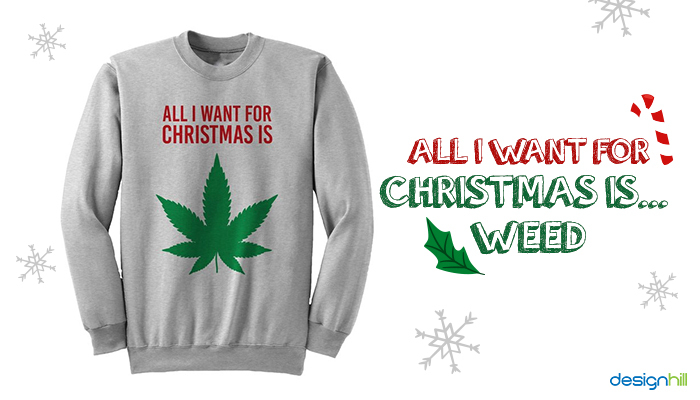 All I Want for Christmas Is…Weed! Looks good, and says it all, ain’t it? If you want to reflect your brand identity through Christmas t-shirts, a formal but creative way is the best measure you can take. 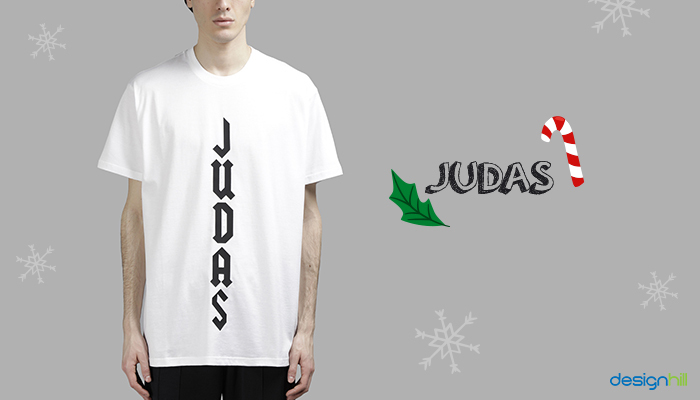 Use our t-shirt design tool and create your own design for your Christmas t-shirt. Use an image of the Christmas Tree – orthodox, but effective. Use a positive, inspiring and relevant line like ‘Light it up.’ Use your brand image/logo. That’s it. Your Christmas t-shirt design is done. 15. Santa! OMG! I Know Him! 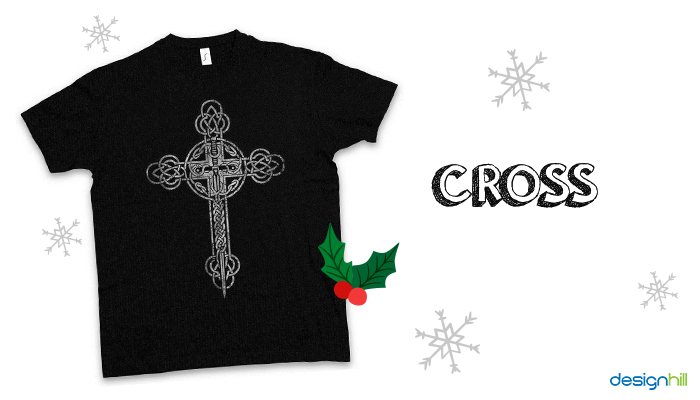 A different design for your Christmas t-shirt, with a little Gothic touch. 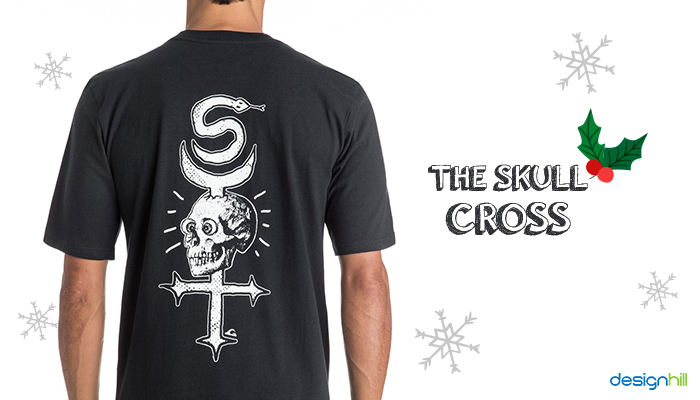 The cross of skulls on your t-shirt will tell the story of a different Christmas you have on your mind. 17. Wanted! Santa! Dead Or Alive! If you are not so much fond of Santa, set a different tone for this Christmas. 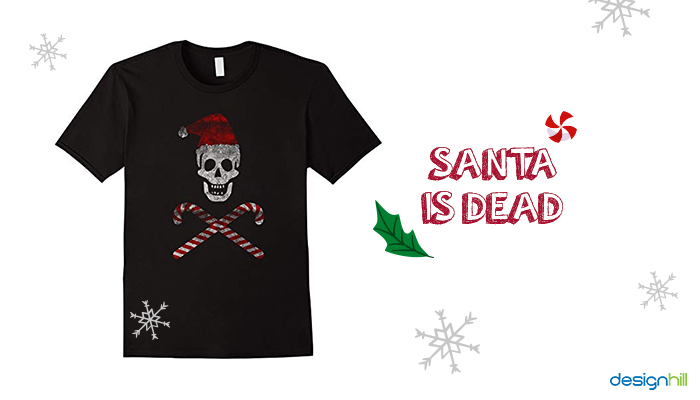 Let Santa do his ‘Ho Ho Ho!’ Your t-shirt would read ‘Santa is dead.’ If you have not received any gift from Santa, that’s the perfect line. 19. OMG! 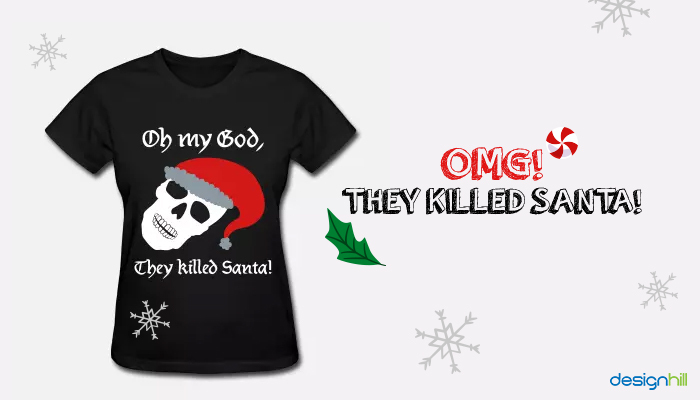 They Killed Santa! 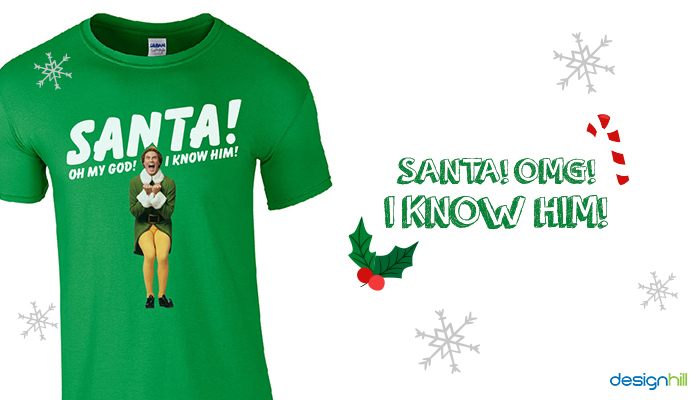 It’s yet another catchy line on your Christmas t-shirt. 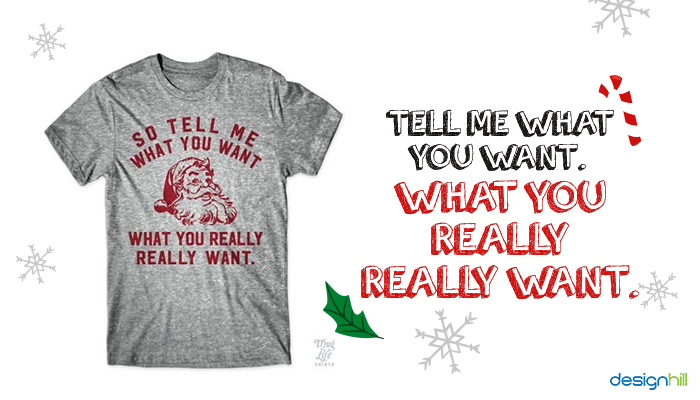 If you believe that this line goes with your take on Santa, let it be on your Christmas t-shirt. Hire a freelance graphic designer on Designhill and get your t-shirt designed. Imagine Jesus or Santa in the Terminator avatar. 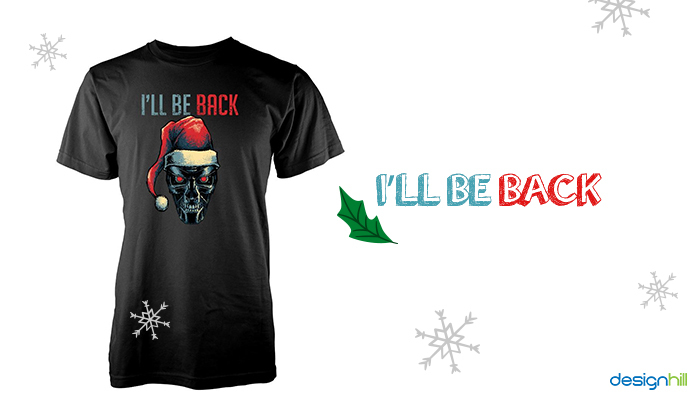 The line below reads, ‘I’ll be back.’ It’s a Terminator lover’s typical way of celebrating Christmas. Do it the Terminator way! A believer? Design your Christmas with this line -‘Jesus washed away my sin’. That’s your way of saying that this Christmas you are no sinner. Get your t-shirt design done by any of the hundreds of designers on Designhill. Be Santa this Christmas. Ask others what they want, what they really want this Christmas. Let that be written on your Christmas t-shirt. Do the design by yourself using our t-shirt maker tool. Use a picture of Santa above or below the line. Are you almost broke this Christmas? Need money? Why don’t you ask Santa for it? 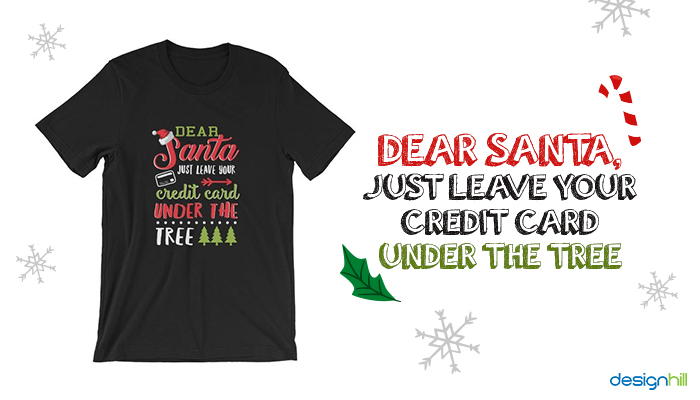 Write it on your t-shirt – ‘Dear Santa, just leave your credit card under the tree.’ Who knows, someone may indeed bless you with some monetary gift. Do you want an unconventional design for your t-shirt? While everyone would choose Jesus and Santa, you should choose Judas. Though he betrayed Jesus, he was the one that Jesus loved most. 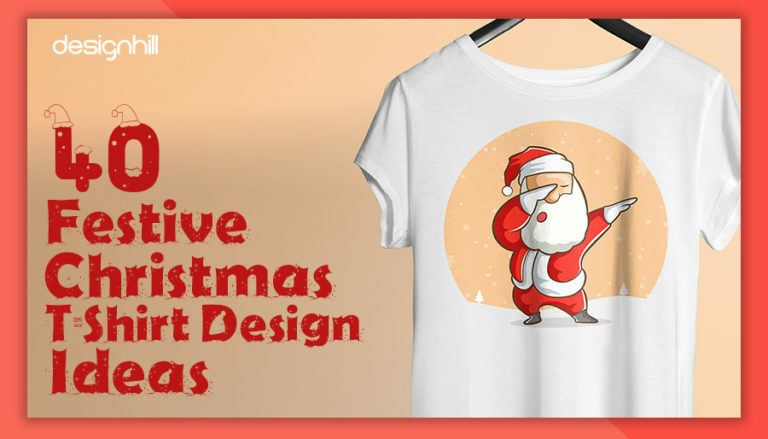 Use our t-shirt design tool and get your Christmas t-shirt customized. 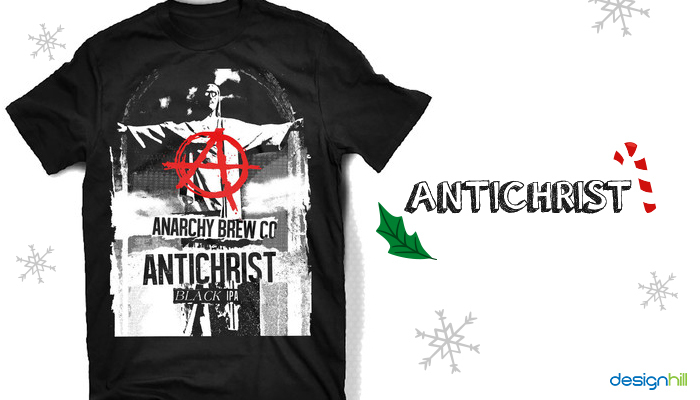 If ‘rebel’ is the word that defines your personality, be an antichrist this Christmas. 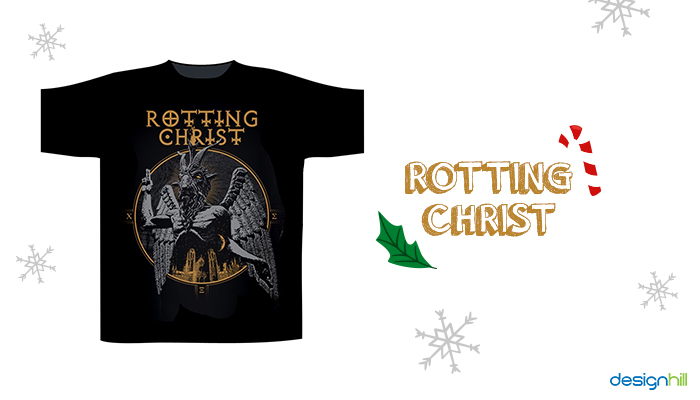 You can choose an antichrist themed image and design your t-shirt with it. In case you need help, hire designers on Designhill, and get the job done. It’s simple and easy. It’s fun. Another perfect t-shirt design for a rebel! If you want to show your affection for the fallen angel, design your t-shirt with the line – ‘Saved by Satan.’ In the midst of Jesus loving crowd, you will stand out and be distinct. If you have to say ‘No’ to Satan on Christmas, put it on your t-shirt. Christmas is not the day you want to have Satan in mind. 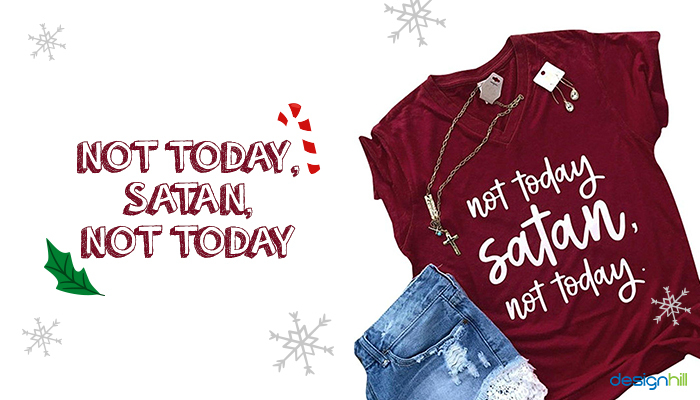 So, tell him, “Not today, Satan, not today.” Everyone will understand that Satan cannot win over you for the day; you have Christmas on your mind. Are you a GOT fan? Is ‘Winter is coming’ your way to say that something is going to happen? 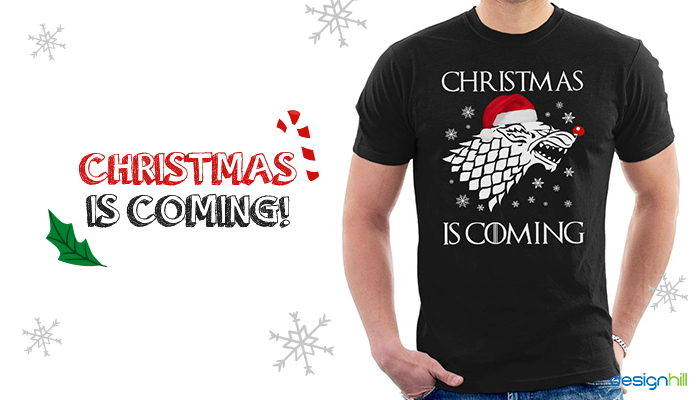 How about wearing a ‘Christmas is coming’ t-shirt before the Holidays? While you announce that Christmas is coming, you also make it clear that for you the world consists of ‘the seven kingdoms’ and you belong to the House Stark of Winterfell. 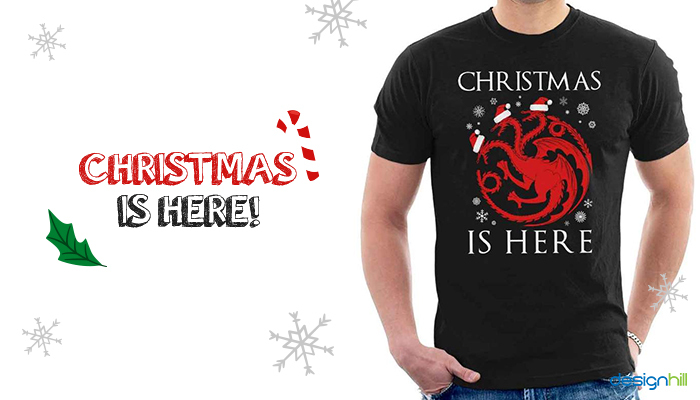 After you have flaunted ‘Christmas is coming’ for a few days before the Christmas, you must wear ‘Christmas is here.’ If you are a die-hard GOT fan, you’ll know how important it is to say ‘Christmas is here’ after you have been saying ‘Christmas is coming’ for days before the Christmas. If you run a social media page related to Game of Thrones, get a customized social media page designed by expert designers on Designhill. 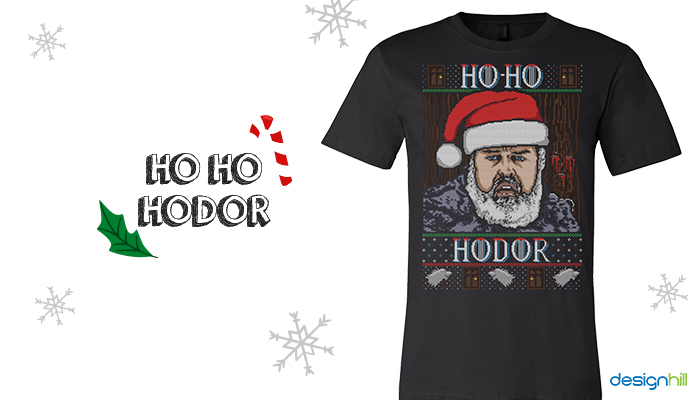 How about Santa on your t-shirt has the Hodor Avatar! Ho Hodor – that’s what he will say. Choose our graphic design services and get a GOT themed t-shirt design. Ho Hurry!! The son of God, who had to wear the crown of thorns, will now sit on the Iron Throne, the throne of blades. If you get this design on your t-shirt, you will carry an entirely new perspective. Feeling tempted? Use our tshirt maker tool and get your t-shirt designed now! 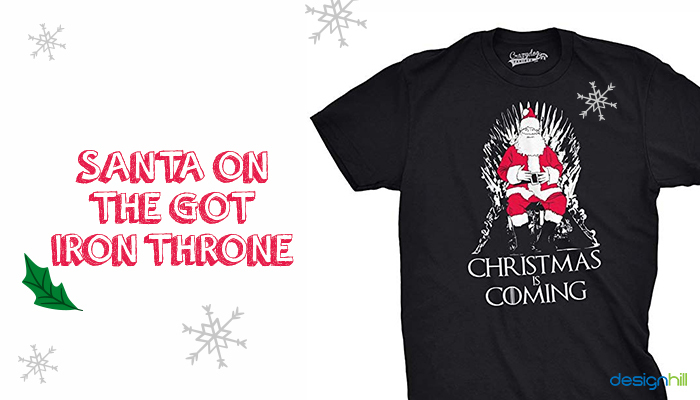 If you do not like the idea of Christ sitting on the Iron Throne, let it be Santa, then. Let the happy man sit on the chair of blades and say, ‘either you believe, or you die.’ Sounds very much relatable, eh? 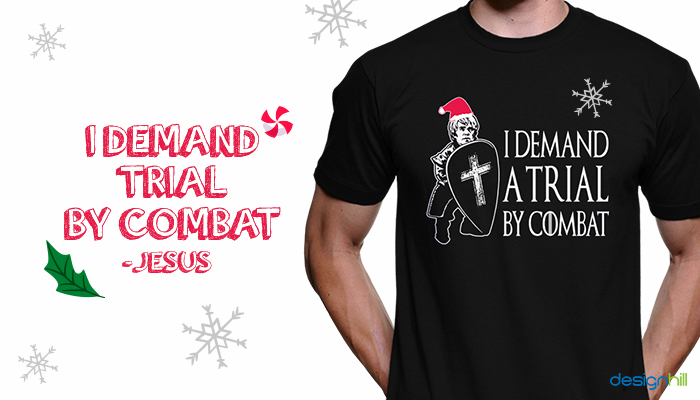 Imagine Jesus standing in front of the Romans and demanding a trial by combat! Isn’t that amazing! 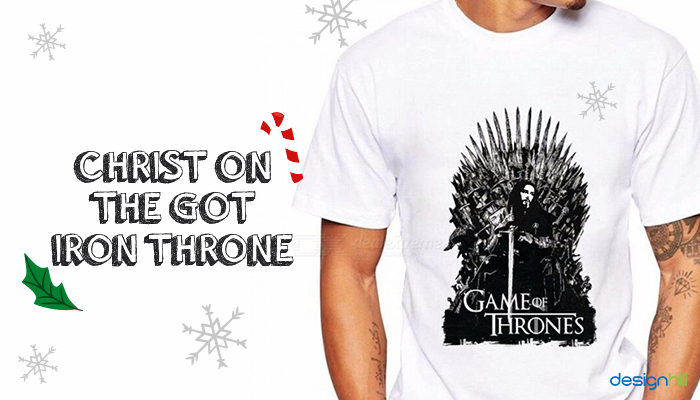 What better t-shirt design can a GOT fan have for Christmas! Get your custom-designed t-shirt now! Love superheroes? 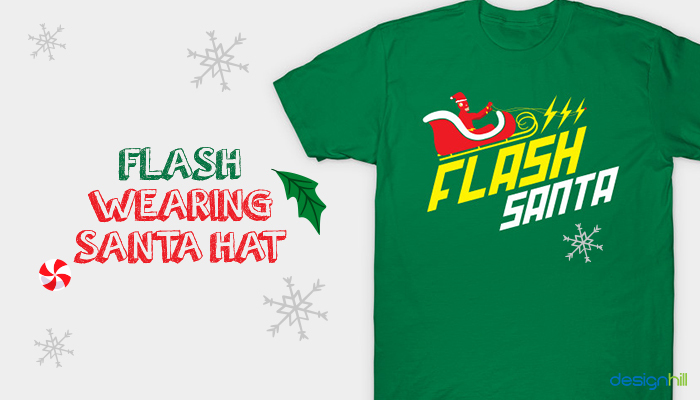 How about Flash or any other superhero of your choice donning a Santa hat on your t-shirt? You will love it for sure. Are you one of them who think that there is no better thing to do on a Christmas than to go fishing? 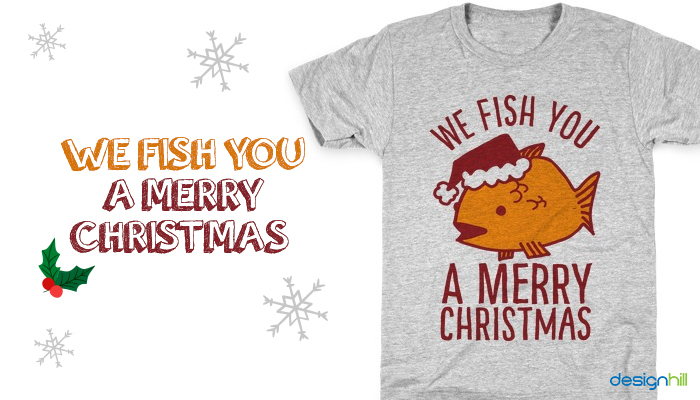 We have a t-shirt design idea for you – We fish you a Merry Christmas, the line must come with an image of a fish. 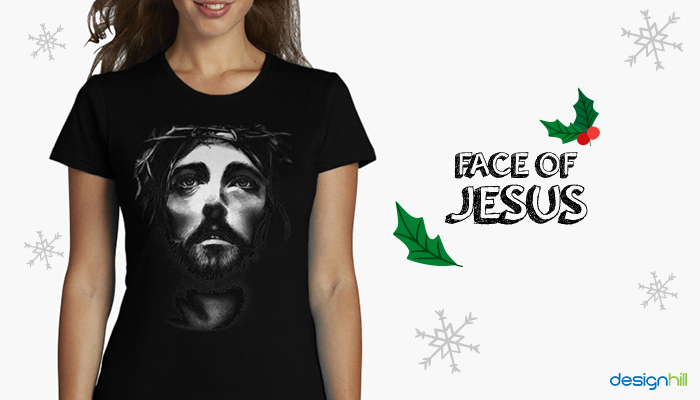 Get a custom design for your t-shirt – Jesus and you side by side. The caption below – Birthday Boys! That’s the perfect t-shirt design for you if your birthday is on 25th December. 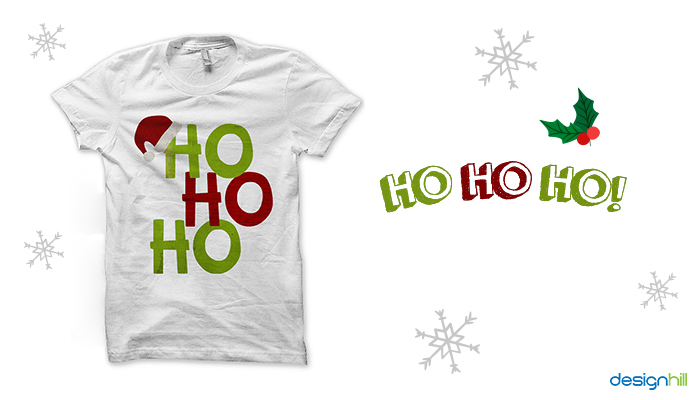 If you are that enthusiastic about Christmas, let your t-shirt reveal how excited you are. 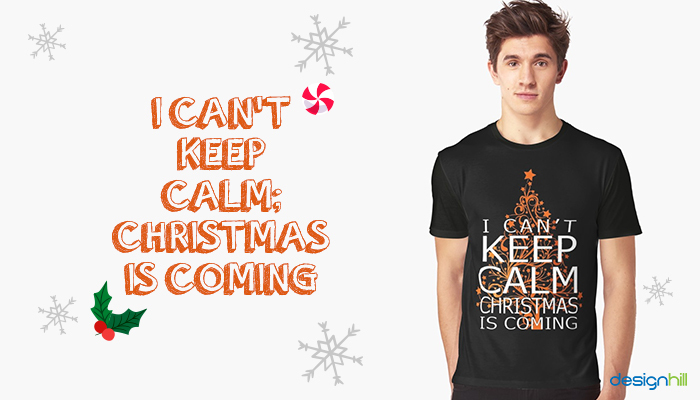 This is the perfect line for you – I can’t keep calm; Christmas is coming. You might not like the fact that many people say a lot of things and attribute them to Jesus. You wonder what Jesus might have thought had he heard that these people are saying random things in His name. That’s it. 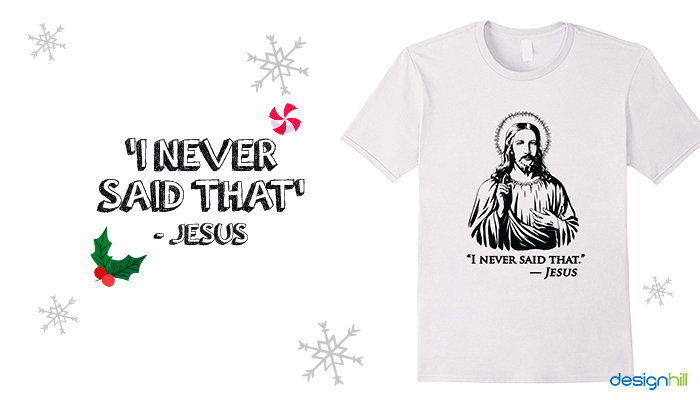 Say what Jesus might have said – ‘I never said that’!! So,what’s your design? 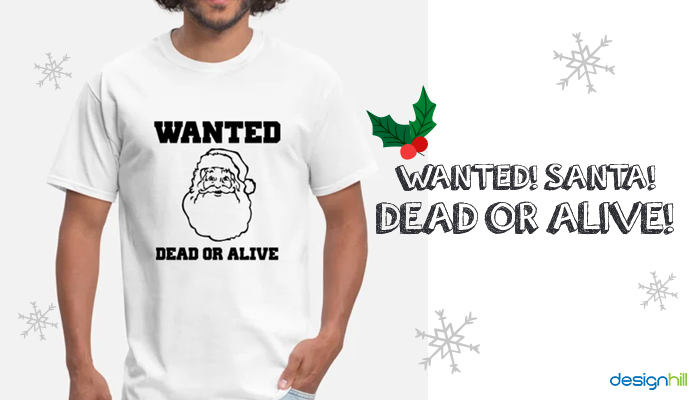 These are some of the Christmas t-shirt design ideas that you can try. If your choice is not included in the list we have provided here, get your own design created on Designhill. Pick the t-shirt color, select your design, enter any text you want, design the back of the t-shirt if you want, and order it for print – it’s that simple. What are you waiting for? Get started now!